On the night of January 20 & 21, 2019 a total lunar eclipse will occur. The Moon turning ‘blood’ red will be visible in the evening skies on the 20th from North America, Central America and South America. It will also be visible in the early hours from Africa, Europe, and parts or Western Asia before moonset/sunrise on the night of 20th / 21st January. During this event, the full Moon will pass through the Earth’s shadow (or umbra) lasting around 5 hours and 12 minutes from beginning to end. The illustration below shows how the Moon will pass through the upper portion of the Earth’s central shadow. This means that our natural satellite may not appear as dark as the great long total lunar eclipse in July last year. However, there are more factors at play here (read more below). How will the eclipse look on January 21, 2019? The Moon will slowly turn from its familiar pearly white colour to a reddish colour then back to its original colour all over a period of around five hours. The shade of red can vary from eclipse to eclipse depending on a few factors including conditions in the Earth’s upper atmosphere and the position of the Moon along its orbit. If there have been any significant volcanic eruptions for example, this can cause the Moon to appear a much darker red than of other eclipses. The added amount of volcanic ash and dust in the Earth’s atmosphere can prevent more of the Sun’s light from refracting around the Earth causing deep, dark red effects. The total lunar eclipse on 27 July last year was considered particularly dark. Some speculated that this was down to recent volcanic eruptions and also the fact that the Moon travelled deep through the center of the Earth’s umbra. The eclipse occurred during an Apogee Moon with it is farthest from the Earth. The total lunar eclipse in 2015 by comparison occurred during a perigee Moon when the Moon is closest to the Earth (coining the phrase ‘Supermoon Eclipse’ at the time). This meant that the Moon was deeper in to the Earth’s umbral shadow cone. 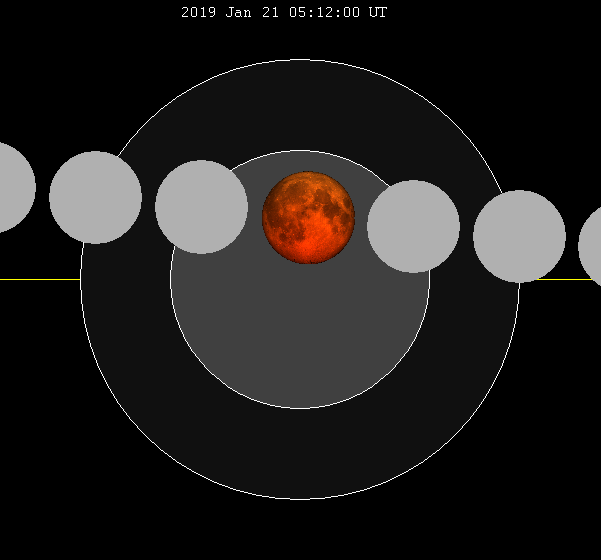 All that being said, it’s hard to predict with certainty how red the Moon will appear on January 21, 2019. It’s best to wait and see and enjoy any surprises that this most easily observed astronomical event may reveal.